Final presidential debate: Either Romney or Obama won. Here's how to fix the debates for 2016. One solution: More Raddatz, less Shieffer. Partisans will never agree on who won Monday night’s debate, but now that the 2012 presidential debates are over, surely we can all agree on some winners and losers: the moderators. After the first debate’s Jim Lehrer debacle, wherein big-time loser Lehrer basically asked the candidates to share their campaign talking points, Martha Raddatz saved the entire concept of debating by opening the vice presidential showdown with a smart question on Libya and then pushing for specifics on tax plans, Medicare, and Social Security. 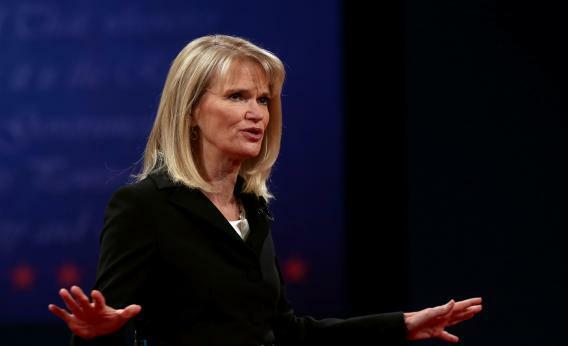 The best part of that VP debate was seeing Raddatz act like a journalist, not just a host. She is the hands-down winner of the 2012 debate season. Foreign policy moderator Bob Shieffer and town hall chaperone Candy Crowley fell somewhere in between. Schieffer had some trouble keeping the candidates on topic, as foreign policy drifted into domestic. And Crowley simply didn’t have much to work with, given the town-hall format and her limited ability to intercede. Much has been made of how this was the first presidential election cycle to feature two women moderators. To my mind, probably too much. There are other reasons for Raddatz’s (and some have said Crowley’s) success: They are both reporters, not anchors. Perhaps their relative moderating inexperience worked in their favor. But if there is one gender issue to be raised, this is it: The women got stuck with the crap debates. So here’s a suggestion for 2016: Raddatz moderates the first debate, which is the only one that people really care about. By virtue of her dominance in the 2012 debates, we demand another correspondent with foreign coverage chops to handle the foreign policy debate. And for the town-hall debate, if we continue to insist on that charade, the Commission on Presidential Debates will draw names from a hat. Choices to include the co-hosts of The View and Ryan Seacrest. As for the vice-presidential debate? Big Bird. Or Jim Lehrer.